Ten years ago Burberry transformed itself from a British country staple to a high-profile youthful brand. 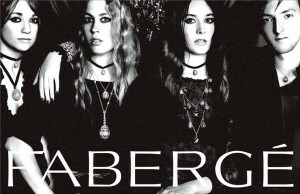 Pringle of Scotland followed suit and now the legendary Fabergé is shedding its mature haute couture image in favor of young and hip. Starting this spring the jewelry company will run a new advertising campaign. Shot by fashion photographer Mario Testino, the print ads feature Fabergé descendant Josh Fabergé and some of his friends interacting with the jewelry, pairing it, layering it and wearing it all in playful new ways. As for the ad campagne I like it. I like the casual feel to the models and the layered combination of big and small egg pendants. The egg choker on the guy is snappy and unexpected. The group together dressed in black look like a 70s rock band. The ad is young and hip, so good for them. But, it will be interesting to see if the old iconic egg associated with celebrity collectors and ancient aristocrats can be successfully reinvented and appeal to a younger market. In these days of austerity, the Occupy Movement, and chants of I am the 99 percent, will luxury brands become uncool?